We don't know an awful lot about these breeches except that they are made of leather/suede, that Mick Tighe bought them on the internet for £20 in 2015 and that they are fabulous! 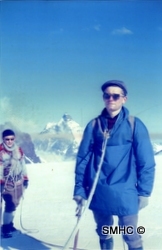 The seller indicated that they had been worn when climbing the Matterhorn in Switzerland in the 1960's which could mean that they are Swiss though they are similar in style to the Bavarian Lederhosen (leather breeches) albeit without the braces which are common to that type of clothing. Leather/suede breeches were common for outdoor enthusiasts such as climbers, horse riders etc. in the 1950's though rather more expensive than the ex-army gear that most folk wore. This pair certainly look to be at the top end of the market and the lack of a makers name could indicate that they were made to measure. A fabulous addition to our collection whatever. 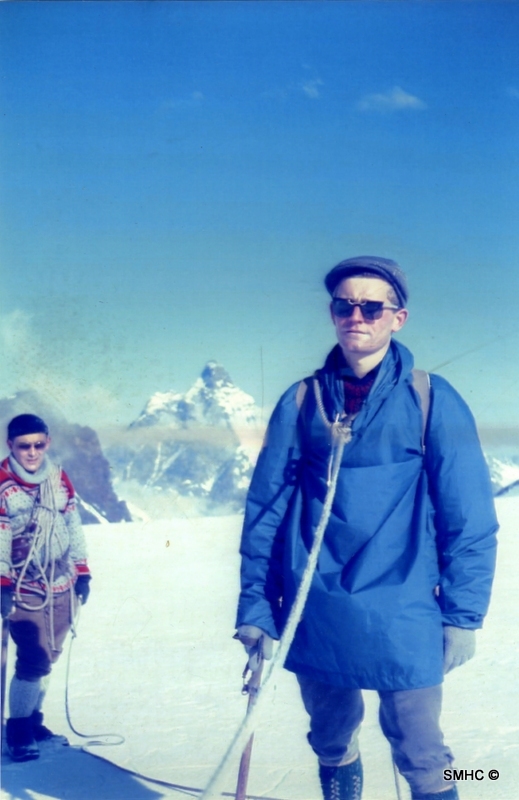 Seems that the breeches belonged to Colin Duree, who can be seen wearing them on the Rimpfischhorn in 1964 in the photo opposite. He'd bought them in Zermatt the year before for £25. Thanks to Colin's son Richard for info and photo.